Wo r l d ! 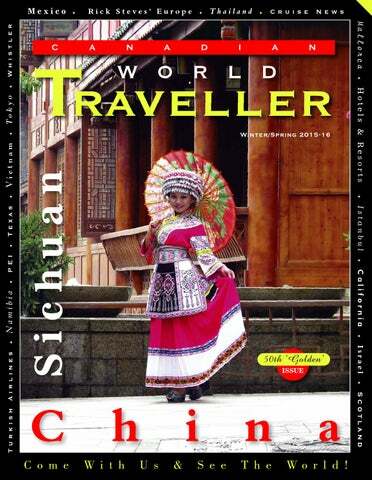 Welcome to Canadian World Traveller n this issue we start our worldwide tour in hot and spicy Sichuan, China. In Asia we explore the fabulous and less travelled region of Isan, Thailand, head to Vietnam for a wonderful bike ride and then jet of to the worldly city of Tokyo. In the Americas we go on a dream road trip from San Diego to San Francisco, head to Texas for some world class birding before heading further south to Cancun for some snorkelling with Whale-Sharks and finely to Whistler for a luxury stay at the Fairmount Resort. In Europe we visit the beautiful and historic Spanish island of Mallorca, we then head to Scotland for a round or two before joining Rick Steves for a night-time tour of the eternal city of Rome. While in the Mediterranean we explore the many faces of Istanbul and then travel the span of intriguing Israel. In our Cruising section we jet to three continents, from New York we cruise on the futuristic new Anthem of the seas, sail around the Galapagos and finally through south-east Asia with G Adventures. Happy Travels! Michael Morcos Greg James Contributing Editor David J. Cox Graphic Artist Al Cheong Advertising Leo Santini Marketing Tania Tassone Distribution Royce Dillon Contributors: Ruth Atherly, Natalie Ayotte, David J. Cox, Susan Campbell, Cherie DeLory, Steve Gillick, Jennifer Merrick, Ron Paquet, Johanna Read & Rick Steves, Front Cover Photo by Michael Morcos: Sichuan, China Disclaimer: Canadian World Traveller has made every effort to verify that the information provided in this publication is as accurate as possible. However, we accept no responsibility for any loss, injury, or inconvenience sustained by anyone resulting from the information contained herein nor for any information provided by our advertisers. hy spend days recovering when you can take this homeopathic remedy during the flight and feel fresher upon arrival at your destination. 32 tablets in each packet - sufficient for 45 hours flying time. Cuisine, Histor y, Culture...and Pandas too! 10 ichuan Province is one of the largest provinces in China, with a generous mix of plains, hills, mountains and plateaus that offer landscapes any artist would love. Located in southwest part of the country, it is a gateway to Tibet, and its capital city, Chengdu, is a cultural and industrial center famous for its luxurious satins, brocades, and lacquer products since the 13th century. The Cuiping Mountain in the centre of the city provides wonderful views of Yibin from all angles. Liubei Pond Park is Sichuan Provinceâ&#x20AC;&#x2122;s most famous scenic spots and is famous for inspiring the great calligrapher Huang Tingjian. This tranquil park also has live actors who dress in ancient clothing and go about life as if we were in old China. An amazing glimpse into the past of this ancient culture! Abundant natural beauty can be found within the stunning landscapes that include ravines, rivers, hot springs, waterfalls and limestone caves. Some local areas have been developed into scenic sites for tourism, including the Lizhuang ancient city, Xingwen Stone Sea and Tianquan Cave, and the mountains host more than 50 kinds of rare animals, including giant pandas that visitors can see at the Chengdu Panda Breeding and Research Center (one of the most important research centers in the world for the conservation of giant pandas). Yibin is also home to the Wuliangye Group who produce a very popular national alcoholic drink. Their headquarters is so large, it is like a city within a city! The company is important to the area as they are the biggest employer in town, and the locals are proud of the connection. There is a rich, textured history and culture that can be found here, as Sichuan is one of the birthplaces of the Chinese nation and plays an important role in China's history. As early as 25,000 years ago, civilization appeared here and has left this area abundant in historical heritage. The City of Yibin is a fine example of this historical significance. Among many attractions there lies ancient buildings and structures that date back through the ages. Natural wonders abound with several hot springs near Yibin, including the Bamboo Sea (acres and acres of Bamboo plants) and the Xingwen Stone Forest. Another interesting feature of the park is a gigantic sinkhole, the largest in the world! The sinkhole is about 650m long and 208m deep! These caves are among the best I have ever visited, at times imposing, and other times awe-inspiring. The park has made it easy to walk around as everything is well lit and the paths are easy to walk. A final spot on this journey through Sichuan Province was a once in a lifetime trip to the Chengdu Panda Bear Research Center and it is the world’s only place that focuses entirely on the critically endangered giant Panda. This is one of the highlights in the city of Chengdu, Sichuan, as well as in China, and was a true highlight of the trip. The place is enormous and there is ample space for the animals – a rarity in the zoo world. The animals were very active while we were there, and the Panda cubs were absolutely adorable. We were very lucky, as the Panda handlers had brought the young cubs out for us. Though we were not allowed to touch them, we were allowed to take photos and videos of them. The Xingwen Stone Sea is a world famous scenic spot with amazing features, including the longest natural scenic viewing limestone cave in China called the Tianquan Cave, which holds a record in space and length. With stone flowers, stone bamboo, stone pillars and more, the cave system has features that will please every cave fan, including my favourite, an underground river! The surface stone sea extends 10 kms from east to west, and 4 kms from South to North with wonderful shapes and imposing features. There are stone peaks to the south and a dense stone forest covers the west and north, with the great ‘Peak of Couples’, standing just like a couple with hand in hand. The Bamboo Sea of Southern Sichuan is one of the largest bamboo forests in China and has been among the most well-known tourist destinations for visitors. It is a natural wonderland created and, a place that is far more mysterious than the mundane world of everyday tourism. The core area holds over 5000 hectares of huge and upright bamboo shelters ridges, peaks and hills stretching all around the area. It looks like a vast green sea with a bamboo forest containing further treasures, including the Rainbow Waterfall and the Fairy Lake among others. The Waterfall is a towering 200 meters high and as the sun shines on the waterfall, rainbows are often seen. The Fairy Lake is the ideal location for tourists to enjoy bamboo rafting. Sichuan local cuisine, known worldwide, is available, inexpensive and delicious. As in most of China, we were treated to colourful shows, costumes, music and dance, but the Xingwen Miao Minority Folk Residence is one of the best spots for this. The Miao are one of the biggest minority groups in China and in their new complex they treat visitors to song, dance and art exhibitions. With the intricate moves and fabulous costumes, it is easy to understand how China can produce such amazing shows at events like the Olympics when local shows are this good! They also have a cinema showing documentaries of pandas, offering a deeper understanding of these interesting creatures. hough our summers here in Montreal are glorious, there is a really good reason to go to Cancun in the middle of August if you love marine life, and are seeking the thrill of a lifetime. That’s the only time of year you are virtually guaranteed to be able to encounter and snorkel the world’s biggest fish- whale sharks! No worries, they don’t eat humans. In fact they are strictly filter feeding plankton eaters, and though they can grow to the size of a small school bus (40 ft.,) they are perfectly gentle. You just need to stay out of the way of their tail, as it’s a powerful propeller that can send you reeling! I relied on Amstar DMC to steer us right and book the ideal operator for it. They are my favorite most trusted tour and transfer company in Mexico, and once again they came through big time. They chose the Cancun Adventures Company and our time with them was outstanding. They only take very small groups, and our guide- who also doubled as our photographer and videographer- was extremely well informed about the animals and highly concerned with our safety. Some operators take huge groups of tourists and just set them loose on the whale sharks, and even chase them with boats. So if you go, please ensure that you book with a decent outfit. So What’s A Whale Shark? Not much is known about these giants of the deep; in fact, scientists have been busy the last few years trying to figure out what makes them tick. They have rarely been seen mating and they don’t travel in pods. They are very solitary creatures, and though of the shark family they are more the size of whales and look like giant catfish without the whiskers. And they only get together when the underwater dinner bell rings and there is a great feast of their favorite food- plankton, krill and tuna eggs as there is each year in the summer just off Cancun. The entire activity takes about 8 hours. You leave early from Cancun, and sometimes it takes awhile to find the whale sharks, but when you do they are typically all together in one spot. Snorkeling with them is surreal- a little scary at first- but then magical. We even had a baby whale shark swim right up to the our boat to check it out! Mind you, they don’t seem to be as intelligent as whales or dolphins – you don’t get a sense of connection with them. I assume they just think we are weird looking fish, and basically their biggest concern is taking in as much food as possible while they are there. But they are gentle and easy going, and will only dive deep if you are annoying them or if they don’t like your smell! You are asked to wear as few chemicals as possible- deodorant, sunscreen even shampoo bothers their eyes and they will take off if they become irritated by it. Choose The Right Operator This was my second whale shark swim. I enjoyed it so much a few years ago I had to return, and this time I also brought along a fellow female travel writer friend. Though she’s not much of a water person, this experience is easy. You must wear a life jacket anyway, and the saltwater helps you float- it’s simply a matter of keeping up to the animals. But it’s very important to choose a reputable tour operator, as it’s not highly regulated. The adventure takes place in international waters, and though there are safety and behavior guidelines and even laws, they are difficult to enforce. After the epic adventure you stop at gorgeous Isla Mujeres for lunch (the Island of Women) just off Cancun at a breathtaking beach and view the photos and videos they took which you will surely want to purchase for posterity. Though you are welcome to take your own photos as well. The Ideal StaySecrets Playa Mujeres Ten minutes north of the main tourist strip of Cancun is a brand new resort that was ideal for our glorious girls getaway, and also as a base to do the whale shark adventure. Directly across from it is Isla Mujeres (Playa Mujeres means the beach of women) and we both stayed in a Preferred Club suite with our very own dipping pool facing a sprawling white sand beach with calm aqua waters. Divine! The Secrets brand is always adult-only and upscale all-inclusive, and this new installation is absolutely stunning with a worldclass spa and every conceivable luxury you can imagine. We absolutely loved it. And if you golf, it’s minutes away from a premium course as well. We don’t golf, but there was plenty to do there including enjoying all the offerings that come along with Unlimited Luxury® their trademark all-inclusive program. Turned out we hardly had enough time to sample all of it either- unlimited cocktails, 24/7 room service, fine no-reservation dining at multiple themed restaurants, and tons of entertainment and nature activities. It was exhausting just trying to enjoy everything! But it did end up being the perfect way to completely rejuvenate and celebrate our exciting escapades with whale sharks. I highly recommend both. Rome at Night by Rick Steves n Rome, sunset brings unexpected magic. A stroll in the cool of the summer evening is made memorable by the romance of the Eternal City. The tourist who retreats at night to an air-conditioned hotel room is missing the best time to plunge into Rome. Once the museums close and the crowds thin, Rome relaxes. The city--so grand and monumental by day--becomes intimate and approachable. On my Roman night walks, I like to sit so close to a bubbling fountain that traffic noise evaporates. In the evening, it's fun to jostle with kids to see the gelato flavors or watch lovers straddling more than a bench. While strolling past polizia in flak-proof vests, I marvel at the ramshackle elegance that softens this brutal city for those who were born here--and can’t imagine living anywhere else. These are the flavors of Rome, best enjoyed after dark. My favorite nighttime stroll, from Campo de’ Fiori to the Spanish Steps, mixes romance with history as it focuses on Rome’s floodlit nightspots and incomparable urban spaces. ing through rocks as well as the exotic flora and fauna from newly discovered lands. From Piazza Navona, head for the Pantheon; sit for a while under the floodlit portico of this great temple to the gods of Rome, rebuilt by the Emperor Hadrian in A.D. 126. The pagan temple survived so well because it became a Christian church after Rome fell, saving it from scavenging locals who would have carted away its stones (as they routinely did with once-great, then abandoned ancient Roman buildings). The 40-foot granite columns of the Pantheon’s entrance, showing the scale on which the ancient Romans built, support a triangular Greek-style roof with an inscription stating that “M. Agrippa” constructed it. In fact, the roof was put in place by Hadrian, who credited the builder of an earlier structure. The impressive entranceway gives no clue that the greatest wonder of the Pantheon lies inside—a soaring domed space that inspired Michelangelo’s St. Peter’s and Brunelleschi’s Duomo, in Florence. Pietro—is, like all of Rome’s fountains, powered by an aqueduct. The piazza offers a thriving night scene. Window-shop along the elegant Via Condotti, which stretches away from the steps. Walking down a cobbled street, softly illuminated as if by torchlight, it’s easy to imagine I’m rubbing shoulders with the past. In Rome, give me the night. Rick Steves (www.ricksteves.com) writes European travel guidebooks and hosts travel shows on public television and public radio. Email him at rick@ricksteves.com and follow his blog on Facebook. © 2016 Rick Steves' Europe. All rights reserved. Article & Photography by Steve Gillick utside of Khong Chiam we sat down to talk with the Abbot of one of the forest temples. With our guide acting as interpreter, he told us that after 16 years as an insurance salesman, he came to the realization that his busy city lifestyle was not only stressful but was both unsatisfying and incompatible with his Buddhist upbringing. So he quit his job, studied and eventually became ordained as a monk. Five years ago he moved to the forest temple where he could use all five of his senses to engage with nature and better appreciate the tenets of Buddhism, and ultimately continue on the road to spiritual fulfillment. 8:00 am, everyone boarded with bags, boxes and baskets of produce (plus a few frantic chickens) and 20 minutes later they all rushed off the train to set up their stalls at the Kabinburi market. using large wooden looms. The rest of the family assists in cutting and storing the straw and the results are large colourful table and floor coverings and smaller mats for sleeping and eating. For us it was a photographer's dream come true with friendly, chatting vendors selling clothing, household items, colourful fruits and vegetables, pungent spices, freshly caught fish, prawns and crab, chicken, pork, eggs, soups and all varieties of sweets. Closer to Udon Thani, mystical beliefs come alive at The Naga Forest Temple, believed to be the entrance to the underground world of a giant serpent. The mythological snake (Naga) is said to have breathed fireballs into the sky to form steps for the Buddha to ascend to heaven. Passing by the sevenheaded snake statues, a 100 meter bridge connects the Buddhist Temple to an island, where colourful garlands protect the trees, families gather to pray in the many small shrines, and the devout rub giant gongs in a circular motion to produce a singing sound that is said to appease the Naga and bring good fortune. observation platforms puts you faceto-face with rock paintings that depict hunting, fishing and scenes from daily life as it was 3000 to 4000 years ago. But with all this physical activity and talk of markets and dining, it's good to know that Isan offers nothing short of culinary bliss for breakfast, lunch and dinner. Over the 8 day trip we indulged in crunchy papaya salad, spicy duck salad, 1000 year old eggs fried with basil, garlic squid, grilled prawns, steamed fish, scrumptious Tom Yum Kung and Tom Ka Guy (soups), fresh mountain vegetables, local fruits such as mango, mangosteen, rambutan, dragon fruit and, snake fruit, Pad Thai, rice noodles, Korat noodles, sticky rice dishes, fried and grilled chicken, sweet tamarind, lotus root...and more! The last two nights of our journey were spent at the Peerada River View Resort in Khong Chiam where our room was steps from the Mekong River. In the evening we were entranced by spectacular sunsets, with Laos only a stone throw away on the far side of the river, and in the morning we would watch fishermen cast their nets, silhouetted by the golden sun rise. It was a fitting conclusion to a unique adventure, steeped in awe, bound in reflection and experiencing a lifestyle very different from our own. For those who have explored the BangkokChiang Mai-Phuket circuit in Thailand, Isan's undiscovered attractions, amazing food, friendly people and engaging culture are the logical next step. www.tourismthailand.org Top image: Nakhon Phanom monks From left: Sunrise on the Mekong River in Kong Chiam. Phimai Temple Complex. Weaving colourful straw mats at Koo Kaew Village. Making Pad Thai at one of the night markets. Papaya Salad. The gold stupa at Wat Tham Padan. Making the giant gongs sing to appease the Naga Spirit at the Naga Forest Temple. 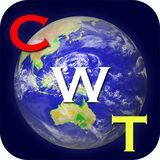 he Spanish empire has a long history, and the country has withstood the tests of time to become a world player, and an absolute must spot for a trip! and was transformed into a museum that, after being restored in 1976, became the city's History museum and a hub for many different public ceremonies, cultural events, and concerts. Museums and history are a part of Palma`s fabric, and a visit to the Fundació Pilar I Joan Miró museum is not to be missed. Dedicated to the work of the artist Joan Miró, there is a main building exhibiting works donated by the artist, a library, a sculpture garden, Miró's studio Sert, and the Finca Son Boter. The museum was designed by the renowned Rafael Moneo and built in 1992. We moved on to the city of Petra, birthplace of famous missionary Brother Juniper Serra, founder of many Californian missions including one in of San Francisco and another in Los Angeles. In a stroke of luck, our visit coincided with a Cannonizing ceremony held for him by none other than Pope Francis! The local church in Petra has many statues of saints whose names were borrowed in California including San Diego and San Francisco. His work in California included many recorded acts of piety and a dedication to his missionary efforts for which he was granted the posthumous title Apostle of California. The Pope`s declaration of Serra as a Catholic saint was a controversial one, as many aboriginal tribes criticize Serra's treatment of their ancestors and associate him with the suppression of their culture. Caves of Artá lie in the northeast of Majorca, around 60 km from the island's capital of Palma. Visiting these caves one can understand why it has been used in films like The Golden Voyage of Sinbad`, as they offer an other-worldly feel! Once in the town of Artá we ate at the Sant Salvador restaurant, great home style Mallorcan food. Olives and almonds are typical, and there are many delights awaiting the palate, like sobrassada, arròs brut (saffron rice cooked with chicken, pork and vegetables), the sweet pastry ensaïmada, and a delightful herbal liqueur Herbs de Majorca. As with most mediteranian beaches, the sands and azure water combine to make a memorable day for the whole family. A stop for pictures from Es Mirador d’Es Colomer (Pollença) must also be made, as there are breath taking views from high upon the cliffs. We then visited Teixits Vicens, a family-run artisanal textile factory and craft workshop manufacturing Mallorca fabrics that are locally known as Roba de Llengües (Cloth of Tongues). As a testament to their products and professionalism, they have been able to survive and keep an old trade alive in modern times, since being founded in 1854. Soller is an agricultural town nestled in a fertile valley surrounded by olive and orange trees, vegetable gardens and produce. Regular commerce with France has created cultural consequences that are reflected in its architecture and language. Highly praised by visitors, there are wonderful walks along the cobbled path of Barranc de Bini, the Plaza de la Constitució and along the cobbled path of Barranc de Biniaraix. A lunch date at Belmond La Residencia offers a Donkey walking trail tour through the hotel’s olive groves, an enjoyable visit followed by an unforgettable picnic lunch in a stone shepherd’s hut. Further along is a visit to the Royal Carthusian Monastery of Valldemossa, where Frédéric Chopin and George Sand spent the winter of 18381839. A final stop took us for a wonderful sunset while enjoying a delicious selection of finger food and cocktails at the Puro Beach club. All luxurious amenities are offered, including seaside food and drinks, lounges, terrace, pool & SPA treatments. Fun for day and night! You can read more about the great Mallorca hotels in the Stay & Play section of this issue. stanbul is an ancient city that reflects the cultural influences of the many empires that have ruled this magnificent old-world metropolis. From the Roman-era chariot race Hippodrome to the Egyptian obelisks and on to the iconic Byzantine Hagia Sophia featuring a soaring dome and Christian mosaics, there is something for every history buff. My passion for Istanbul has grown since the last time I visited. Historically known as Constantinople, there are many things that I love about this city, from the locals and their hospitality and good-humor to the restaurants, the m端ezzins on their minarets and the lovely tea gardens. This visit would take us throughout the rich tapestry of history, starting with a magnificent boat ride on the the Bosphorus. The Bosporus is a natural strait and internationally-significant waterway located in northwestern Turkey. It forms a part of the boundary between Europe and Asia, and connects the Black Sea with the Aegean and Mediterranean Seas. The shores of the strait are heavily populated as it is straddled by the city of 17 million inhabitants extending inland from both coasts. The cruise is a great way to get oriented to Istanbul and with the right guide, it can be a wonderful floating history and geography lesson! architectural examples in the city. Though it is an architectural wonder, the mystical side is just as unique. When you visit here you can see Islamic and Orthodox Christian symbols mixed together throughout the building. It was built in the 6th century by Emperor Justinian and until 1453 was used as church. When Ottoman Emperor Mehmet conquered Istanbul, it was converted from church to Mosque until 1935 when it was converted again but this time to into a Museum. A site not to be missed! Topkapi Palace Topkapi Palace has lots of history and is popular with the tourists, mainly for its collection of colorful stories, more than most of the world's museums put together. Between the 15th and 19th centuries it was the court of the Ottoman Empire, where sultry concubines were at the beck and call of wealthy sultans, and intrigue infused the Palace with mystery. Visiting the palace's opulent pavilions, Treasure rooms and sprawling Harem offers a fascinating glimpse into their lives. Istanbul was the grand project of Sultan Ahmet I. The mosque's wonderfully curved exterior features domes and six slender minarets. Blue İznik tiles adorn the interior and give the building its unofficial but commonly used name. streets lies the aromatic Spice Bazaar, and just a bit further along is the famous Galata Bridge, offering access to the modern, urban delights across the river in Istanbul’s more residential and contemporary neighbourhoods. Originally a Byzantium Stadium area for Chariot Racing, the Hippodrome of Constantinople is the Heart of Sultanahmet and includes many small monuments from Greece, Egypt and Germany. The Hippodrome was the scene of many a downfall, but even so, emperors and sultans sought to outdo one another in making it more and more impressive, decorating the centre with statues from the far reaches of their empires. Very impressive, and visitors can easily imagine the thunderous races in ancient times. A luchtime break saw our tour stop at the Sultanahmet Köftecisi (The Historical Sultanahmet Meatballs Restaurant), built over four generations of modesty, tenacity, respect and love for the art of cooking. Obviously they are famous for their meatballs, and they do not disappoint! Evening walks took us throughout the city and into all sorts of hidden enclaves and neighbourhoods. The sights and sounds are a treat for the senses, but the taste of the local cuisine is extraordinary. One evening in the Bosphorus, a sector of the more modern Istanbul, we ate dinner at the Dinner at Reina Köşebaşı (kebap menü). The Jet Set are often found hanging out here, as it is a really great place to eat and party, and being a very modern club and resturant, it is quite removed from the old city’s ancient artifacts and buildings that many young find stodgey! Dinner is best spent with friends and our hotel offered up a trip to the best seafood restaurant on the Galata Bridge, the pleasant staff, fresh fish and ambiance were great, and the people watching is superb ! Come With Us & Sail The World! Starting in 2017, Hurtigruten’s expedition ships will sail to the rainforests of South America, to Viking settlements and the national parks in Newfoundland. In the Arctic, the Norwegian explorer cruise line’s guests can explore the largest fjord complex in the world. Hurtigruten bring people together from all over the world to connect with their inner explorer by adding new unique destinations to the program alongside the Norwegian coast, Spitsbergen, Iceland, Greenland and Antarctica. Guests will be taken close to nature with expedition ships MS Fram and MS Midnatsol as well as the new vessel MS Spitsbergen. Discover the Caribbean like never before on the S/V Mandalay The S/V Mandalay sails weekly boarding in Grenada on Sunday and returning on Saturday. Aside from weekly cruises to and from Grenada, throughout the year the S/V Mandalay offers special cruises taking in different Caribbean Islands, such as St. Lucia and St. Maarten! The S/V Mandalay is also available for private charter. The Captain can arrange a personalized itinerary to meet your charter needs including stops in the Grenadines, which may include, Grenada, Carriacou, Union Island, Mayreau, Tobago Cays, Bequia, St. Vincent and possibly some other stops along the way! AmaWaterways’ Zambezi Queen With a design specific for safari river cruising on the Chobe River, the 28-passenger Zambezi Queen offers a sophisticated onboard experience designed to maximize animal sightings. Passanger comfort is ensured when staying in any of the 14 balcony staterooms, all decorated in contemporary style. The air-conditioned top deck of the ship offers a dining room, lounge, bar and pool area for comfort. Enjoy game watching from your stateroom, or visit the top deck for a beverage, sun bathing and more game watching. Peruse the library of books, enjoy a board game and explore the riverbanks of the Chobe River on the Zambezi Queen. For discerning world travellers, there's no better way to explore South America than aboard one of Silversea Cruises' Grand Voyages, scheduled to circumnavigate the continent in 2017. Stretching from the steaming Amazon to the bone-dry Atacama Desert and the glacial peaks of the Andes, South America is a land of stunning extremes, featuring the world's highest waterfall, the world's longest mountain range, the world's driest desert and the world's largest rainforest. Now, the luxury cruise guests of Silversea may discover the continent's dramatic diversity while sailing roundtrip from Fort Lauderdale aboard one of two bespoke voyages: a 63-day Silver Spirit cruise departing on January 16, 2017, and a 66day cruise aboard the line's newest ship, Silver Muse, departing on October 13, 2017. Designed for the traveller who relishes a more leisurely pace, these "Circle South America" odysseys combine the luxury of sailing aboard an intimate, elegant ship with the excitement of discovering South America's most captivating ports, unique cultures, and breathtaking scenery. Highlights include a crossing of the Panama Canal, two days cruising Chile's majestic fjords, a two or three-day stopover in Rio de Janeiro, plus multi-day calls in Buenos Aires and Callao (gateway to Lima and Machu Picchu). In the Wake of the Vikings (15 days; Bergen to Montreal) Sailing Date: September 18, 2016. Eastern Seaboard Explorer (13 days; Montreal to New York) Sailing Date: October 2, 2016. Eastern Seaboard to the West Indies (15 days; New York to San Juan) Sailing Date: October 14, 2016. West Indies Explorer (11 days; San Juan to San Juan) Sailing Dates: October 28, November 7, December 17 and December 27, 2016; January 6, January 16, January 26, February 5 and February 15, 2017. Viking Ocean Cruises® has recently announced that the line will expand its destination-focused cruising to North America and the Caribbean with five new itineraries launching in September 2016. As a nod to the most famous Viking explorer, Leif Eriksson, who set foot on North American soil 500 years before Columbus, Viking Star will also cross the North Atlantic – with a new itinerary that sails from Bergen to Montreal, with stops in the Shetland Islands, the Faroe Islands, Iceland and Greenland. From Montreal, the award-winning ship will cruise the St. Lawrence River and down the coast of New England to New York, during the peak period of fall foliage in October. Viking Star will then make her way down the Eastern seaboard to San Juan, Puerto Rico, which will serve as her homeport for winter Caribbean itineraries. The ship will return to Europe in February 2017, with a transatlantic sailing from San Juan to Barcelona. Passenger comfort is paramount and the ships feature buffet breakfast and sit-down lunch and dinners, observation and panoramic decks ideal for viewing, air-conditioned cabins, a full array of cabin amenities including attached bathrooms, kimonos, library, lounges, spa facilities, Wi-Fi, mini safe and much more. Its all-inclusive pricing means passengers on a Pandaw owned ship can enjoy shore excursions, meals, local beer, local soft drinks, local spirits, mineral water and crew gratruities at no extra cost. Note: Pandaw partner ships do NOT include drinks or crew gratruities. One of the distinguishing features is an ultra-low draft on the ships that allows them to go to more remote areas and shallower waters than would be inaccessible to other boats, so Pandaw can offer its passengers a more intimate experience of the local cultures. Pandaw has 14 meticulously crafted and designed ships accommodating from 10-60 passengers. Each ship has been custom built by traditional craftsmen and hand finished in brass and teak. Luxury and comfort permeate each ship without sacrificing their distinctive colonial character. Personalized service is also a trademark of Pandaw River Expeditions, which provides a passenger-to-staff ratio of 2:1.
recently had the pleasure of attending a two day cruise with Royal Caribbean to celebrate the launch of their new ship Anthem of the Seas. They were also celebrating the fact that they have a new homeport for it in New Jersey –and it was a gala affair. Our launch party aboard the sky deck sailing past the Statue of Liberty at night and also the new World Trade One Tower all lit up, was indeed touching. And even though I’m Canadian, it was hard not to get caught up in the national pride and patriotic hoopla of the event with every song about New York known to man blasting from the speakers, and all the guests waving American flags! It was indeed a real Yankee Doodle Dandy happening! fun. But it does take a long time and is more a novelty than a real service. However, they have no dearth of real welltrained human bartenders at their dozens of bars. In fact, I took a very good classic cocktail making class from one of them. He is an award-winning mixologist whose East Indian name “Shekhar” ironically is pronounced “shaker” in English. We learned the finer art of making classic martinis, and then he made us some of his award-wining concoctions which were very interesting, I especially liked one he made using lavender liqueur. I also had a chance to visit the control room and witness a lot of their ecofriendly practices behind the scenes, and must I was impressed with their efforts. But it was soon apparent that this ship was more about attracting a brand new generation of cruisers. The first clue was the gigantic digital dashboard monitors scattered about- they are certainly keen on connecting with today’s tech obsessed travellers and exploiting the the possibilities of social media. Guest tweets, posts, photos and videos were larger than life in real time as events unfolded. And ther social media crew interacted efficiently. Your agenda is also available as an app. You can make reservations virtually and get alerts about anything via your smart phone. And they were very proud of their new Wi-Fi capabilities, speed and strength-touted as the best on board cruise ships anywhere. Over half of the 2,090 cabins have decks, and the ones that don’t, benefit from an interesting new feature- a virtual ocean view including optional sound. And across the board, they were very flexible to accommodate groups and families with modular interlocking cabins that could be accessed from within rather than from the hallways like adjoining rooms in hotels. They also have some seriously deluxe split-level suites with full dining rooms, glass walls and even private hot tubs on the deck. human elements at Two70. Also Vegas style revues like their current “We Will Rock You” musical also attests to the fact they are out to attract a younger cruising set. And though there is a shuffleboard court, it is looped by a running track, and for those seeking to keep in shape while on holiday there is also a state-of-the-art fitness center powered by Technogym®. Dining & Drinking Of course, they had quality cafes with great baristas and equipment to caffeinate the millennials, but they also have formal fine dining rooms and some very creative restaurants like Wonderland that looks like you went down the rabbit hole. In all, there are eighteen places to eat and many bars and snack spots, so going hungry or thirsty is never an issue. And their new concept called Dynamic Dining® gives one the freedom to pick and choose the restaurants and dining times instead of being stuck with a seating schedule. My overall impression was that this shipthough it would still be good for familiesis really out to appeal to the next generation of potential cruise passengers who are seeking a well-wired, exciting and more eclectic type of holiday on the seas than their parents and grandparents have experienced. But only time will tell if they succeed in attracting them. Day 1 - Ho Chi Minh City Arrival and transfer. Day 2 - Ho Chi Minh City/My Tho Enjoy a visit to the Cu Chi Tunnels and the War Remnants Museum. Embark in the evening and enjoy a welcome drink and briefing. Day 3 - My Tho/Sadek Visit Vinh Trang Pagoda with a short tour of My Tho town en route. Take local boats to Thoi Son Island to see a coconut product manufacturer, taste some local fruit and honey and meet traditional musicians. Continue on to Cai Be and enjoy a visit to the floating market. Opt to cycle the small paths through local communities on the island and visit a Rice Popping cottage industry. Continue by local boat to Vinh Long to meet the vessel. Embark for the evening sail to Sa Dec. Day 4 - Sadek/Xã Vinh Xuong Visit the Kien An Cung Pagoda in Sa Dec and stroll through the market along the river. View the old colonial houses by the delta. Enjoy breakfast and lunch on board as you cruise the Mekong. Arrive at Chau Doc and visit Sam Mountain for sunset. Gaze out over the rice paddies or relax in a hammock. Visit some temples and pagodas along the way. Opt for dinner in town. Day 5 Xã Vinh Xoung/Phnom Penh Cross the border into Cambodia and continue on to Phnom Penh. Enjoy an evening in the capital city starting with a cyclo tour to see the city from a new perspective. Opt to finish up at the Foreign Correspondents Club for Happy Hour overlooking the river or dinner in town. Day 6 - Phnom Penh Visit the sobering S21 Museum and the Killing Fields with a local guide. After lunch, use free time to visit sights like the Royal Palace, Silver Pagoda, the National Museum, or the Russian Market. Day 7 Phnom Penh/Kâmpóng Trâlach Wander through the town of Koh Chen on an island in the river. Visit silver and copper workshops and meet a Khmer Rouge survivor eager to tell his story. Continue to Kampong Tralach and visit the local vihara (Buddhist monastery) and Wat Kampong Tralach Leu pagoda. Opt to cycle, or ride in a tuk tuk or buffalo cart, through the village and past rice paddies to reach the monastery. Day 8 - Kâmpóng Trâlach/Chhnok Tru Sail on to Kampong Chhnang, one of the largest fishing ports on the Tonle Sap RIver. Learn more about the fish farming, pottery and sugar palm production in the area. Wander through the local market then opt to cycle to visit the local industries. Enjoy lunch back on the ship en route to Chnok Tru. Hop in a local boat to visit one of the largest floating villages on the river. Enjoy an evening cocktail and the Captain's farewell dinner. Day 9 - Chhnok Tru/Siem Reap Enjoy a slow morning crossing Tonle Sap Lake. Arrive at the pier near Siem Reap and bid farewell to the boat. Visit the G Adventures-supported New Hope project for lunch and to learn more about the important work being done here. Enjoy a free late afternoon to wander Siem Reap and explore the markets. Day 10 - Siem Reap Rise early to catch the sunrise at the Angkor Wat temple complex. he sea lions frolic. The blue footed boobies preen. The flightless cormorants intertwine their necks in a mating dance. As we drift along shore, new animals come into view. Penguins look at us. A marine iguana searches for algae. Sally Lightfoot crabs -- even redder than the dinner plate variety -- crawl along the rocks. This is a typical two minutes on a panga (Zodiac) ride during a Galàpagos cruise. only a handful of the fish that surround me: sergeant major, parrotfish, and king angel. As I make my way closer to the rocky wall of the island, suddenly I’m surrounded by turtles, big ones who lazily watch the bubbles from my snorkel. I telepathically say to one, "hey, don't you know you're not supposed to get that close to me?!" He looks at me and flicks his long tail as he drifts by, as if to say "the rules apply to you, turista, but not to me". accessible only by boat. While you can see a lot on a day cruise from a hotel, to really understand Galàpagos’ diversity you need to visit more than one island. Islands are quite far apart from each other. The only practical way to see more than one or two is by sleeping comfortably aboard your cruise ship on the inter-island crossings. You have many choices for cruises, but the smaller your ship, the more you will see. This is because with fewer passengers, the logistics are easier for getting everyone off the ship and into small pangas. Panga is the local name for a small boat, in this case the tough inflatable Zodiacs which bring you ashore, to the best snorkelling and kayak locations, and alongside steep rock walls where animals make their homes. If you’re looking for comfort and stability, a catamaran is your best cruiseship choice. The waters between the Galàpagos islands can get quite rough, and the shallower draft and two hulls of the catamaran make it more stable than most single-hulled ships. If seasickness is a major concern, choose a catamaran or the largest (90-100 passenger) ships allowed in Galàpagos. Seasickness tips: Pack pressure-point wristbands (available at any drug store). Choose a lower mid-ship cabin, as you’ll feel even less motion. Ensure your cabin has a private balcony so that you can enjoy the fresh air and gaze at the steadying horizon -- even in your pajamas -- if you feel a little queasy. the main difference between them is comfort and quality. When assessing costs, be sure to determine whether the cost of airfare from the mainland is included in the price. Tourist class: smaller, with basic amenities. Cabins are near the engine room and are often noisy and smell of diesel. Cabins are small, with bunk beds. Bathrooms are usually shared, with limited hot water. Food is budget. Average speed is 8 or 9 knots, so itineraries are limited. Guides will have some English, but are likely not fluent. First class: bigger ships with more communal space and bigger cabins with private baths and sometimes with balconies. Food is adequate. Air conditioning is generally quiet and throughout the ship. Guides are fluent in English. Most islands are included in itineraries. Luxury class: fast boats with the highest standard of design for stability and comfort in the Galàpagos (the calmer Caribbean and Mediterranean fleets have more luxurious boats). Best quality and selection of food and wine, with several places to dine and lounge. Also included are snorkelling equipment, wetsuits and kayaks, which will be in good condition. An outdoor jacuzzi on deck lets you warm up after your snorkel. Itineraries are not restricted by distance. The luxury ships hire the most experienced and skilled guides and crews. Catamarans are the most spacious of all the ships in Galàpagos waters, because cabins and public spaces are spread across the ”bridge” connecting the two hulls. Catamarans are very comfortable and remarkably stable, even on the rough interisland crossings. and a spacious bathroom with 35 L’Occitane amenities. The ships are equipped with several dining and lounging areas, a jacuzzi on the top deck, and all the equipment you need for snorkelling and kayaking amongst Galàpagos’ water animals. The little luxuries make it ideal. For example, after snorkelling on a day cruise, you’ll need to change out of your bathing suit in a cramped bathroom. Aboard a Haugan cruise, you’re greeted with hot chocolate and a big towel after your swim. You can take a dip in the jacuzzi before heading back to the hot shower in your cabin before dressing for dinner or your shore excursion. Best guides, on land and sea By sailing with Haugan you’ll have some of Galàpagos’ top guides. The best guides have their pick of boats, and Haugan is one of the very best. I learned an incredible amount from my guide, Javier. Haugan’s guides are all bilingual (or more), have a very high level of education, and are adept at understanding and adapting to each guest’s interests. Javier makes a point of ensuring I see all the unique underwater treasures of Galàpagos. During one snorkel at Elizabeth Bay, he tells me exactly where to dive deep so I can see a seahorse -- my first outside of an aquarium. He teaches me so much about the seahorse’s habits and habitat, that a few minutes later I find my own seahorse clinging to some seaweed in the gentle current. On land and at sea, Huaguan Cruises is the ideal way to see Galàpagos. www.haugancruises.com Haugan Cruises Haugan Cruises has Galàpagos’ newest fleet of catamarans, and each of their three ships takes just 16 passengers. Galàpagos waters are roughest from June to December, with June to August having the choppiest waters near the main island of Santa Cruz. by Cherie DeLory “If these walls could talk the tales they would tell.” So true is the oft-said phrase. For history hounds there’s infinite mystery and adventure in visiting a century home and discovering about the era and who lived there. Let the sleuthing begin at the following heritage properties in England. Cheers To Brazilian Wine! Over the past 15 years, the Brazilian wine industry has made major investments in technological innovations and the management of its vineyards. The result is excellent quality labels recognized with more than 3,000 international awards. What many don’t know is that Brazil has been producing wines since the beginning of its colonization. The first vines were brought to Brazil by Martim Afonso de Souza, who came from Portugal with the aim of disseminating agriculture in the new colony. Seedlings of Vitis vinifera were planted in the Captaincy of São Vicente, in the southeast. Brazil, the largest country in Latin America is among the top five largest wine producers in the Southern Hemisphere. Among the many excellent products, the Brazilian sparkling wine was the first to draw the attention of international critics. On record as one of England’s oldest homesteads, Hellens Manor dates to the early 12th century. In the rural hamlet of Much Marcle in Herefordshire, the Georgian and Tudor estate remains a family home but is open for tours, as are the english gardens and ancient WOODLANDS. The house is said to be haunted by a female occupant who was abandoned by her lover. She was locked in her bedroom for 30 years before her death in 1728. The window pane reveals a message that she etched with her ring. Wedding receptions are hosted in the Great Barn, and a cider mill produces cider and perry for the annual Big Apple Festival. In the Lake District, Blackwell The Arts & Crafts House, circa 1898, is one of Britain’s most influential historic houses. Arts and Crafts architect Baillie Scott’s innovative design elements incorporate stained glass, ceramic tiles, stonework, intricate carved wood and panelling. Originally a summer home CWT for Manchester brewery owner, Sir Edward Holt and his family, the estate was ATW also a girls’ private school. “Beautiful China” logo represents China’s promising and welcoming tourism industry. Kenwood House in north London’s Hampstead Heath is accessible by tube. The Heath covers 800 acres of WOODLANDS, swimming ponds, trails, and stunning views of the city. The 18th century estate was home to high society’s first mixed race girl. The daughter of a slave lived with her aristocratic aunt and uncle at Kenwood. The book "Belle", chronicling her life, was adapted to the screen. Brewing magnate Edward Cecil Guinness later owned the property, and his impressive art collection is on display. Tours are free. haraja Express â&#x20AC;&#x201C; one of the most luxurious tourist train in India was voted as "The World's Leading Luxury Train" thrice in a row at The World Travel Awards in 2012, 2013 and 2014. M and the Sky Tree provide breathtaking views of the city and on a clear day, in the distance, Mount Fuji sunsets are spectacular. Museums are world class, from the Tokyo-Edo Museum by the Ryogoku Metro station, to the Art Galleries by Ueno Park, to the Japanese Sword Museum and the brand new Samurai Museum in Shinjuku. Tokyo's temples add another dimension to a visit, from the large Sensoji temple and complex at Asakusa to the tranquil Sengakuji Temple in Minato-ku, where the legendary 47 Ronin are buried. And still Tokyo offers so much more. Anime can be enjoyed at the Ghibli Studio or in the shops in Nakano. Electronics are featured in Shinjuku and Akihabara and for those who have an affinity for robots, can enjoy the display in the Sony Building or head to the show at the Robot Restaurant. Shopping and fashion, street markets, coffee shops, Disneyland, parks, architectural wonders, music venues, the nearby hot springs in Hakone, and even a photo visit to the grounds of the Imperial Palace, allow for the ultimate in fulfilling city holidays. Set the myths aside and head to Tokyo. It's one amazing city. all within one hours driving distance include, Blue Mussel Cafe in Rustico, Malpeque Oyster Bar, Malpeque and Carr's Oyster Bar in French river. If you like to fish for your supper the Island has numerous boat charters, from party boats going out for a few hours jigging for mackerel, to private deep sea excursions for big game fish. Island's End Tuna Charters in Tignish, offers the chance to catch Bluefin tuna, some of which can weigh in over 544 kilograms. But that will set you back at $1,250 per day. Or you can go for a $40 boat trip fishing for cod and mackerel at Cambell's Deep Sea Fishing in Covehead. Although the island features many artists, Tony Diodato displays superb PEI landscapes and seascapes. Certainly worth a visit to his two-floor studio in Springbrook off Route 20. Cottage living is the favored accommodation on the island. Whether you chose from cozy one room units to luxury homes, most are close to favored beach regions. For example, a two bedroom cottage, Aunt Elizabeth Cottages in Seaview runs for $1,450 per week. You can travel to PEI by air, or take the 12.9-kilometer Confederation Bridge, from Cape Jourinan, NB, or the ferry from Caribou, NS. Land Rover and the viewing deck. Earlier in our trip we’d been able to watch wildlife from the ground too. We tracked cheetah on foot at Okonjima’s Africat Foundation and enjoyed 20 silent minutes gazing at their surprisingly long bodies while sitting in the sand just a few metres away. we’re surrounded by zebra (dizzying!). Later that evening, lazy lions lie all over the road blocking our only way home (ideal, if only the light hadn’t been too dim to get a sharp photograph). Elsewhere we see giraffe, elephant, warthog and even a rare Cape fox, curled up for warmth just as the sun rises. This is Namibia, where safari opportunities abound. But to see the most authentic animal behaviours, watch the waterholes. It is hard to decide which type of safari I prefer. While you don’t see as much game on a walking safari, being out in a game reserve without the protection of a vehicle or up on a viewing deck certainly gets your adrenaline up, especially if you’re tracking cheetah. At every meal on Ongava’s viewing deck, I keep a sharp eye on the waterhole. I enjoyed my Namibian breakfasts, lunches and dinners (including, a little guiltily, some eland meat), but I see the lions grow gaunter every day. Unique in Namibia is the opportunity to do another walking safari of sorts. Visitors slowly climb the shifting sands of ochre dunes to watch the sunrise over the Namib Desert. After a hot breakfast under a tree, they walk into the desert across dry salt pans to see 900-year-old petrified camel thorn trees. The views are spectacular and a photographer’s dream. When it’s time to leave, I take one last look at the waterhole. I’ve switched allegiance. ”Go Team Lion!” Johanna Read is a Vancouver-based freelance writer and photographer specializing in travel and food. She's eaten well in 48 countries (and counting!) and is trying to repeat her feat of visiting six continents in one year. Follow Johanna on Instagram @TravelEaterJohanna and on Twitter @TravelEater. Check out all her travels at www.TravelEater.net. t the beginning of each year, my husband and I make our wish list of places we would love to visit in the coming year. With so many places to see, we take on this task with enthusiasm and prioritize our three key criteria: 1- Time of year we are both free for traveling 2What we want to see and do and 3- Which country we want to exploreâ&#x20AC;Ś usually by then the location just falls in place! told you the location would fall in place on its own... California it is! on how to make the most of our trip while keeping to our budget. luxurious La Valencia Hotel, also known as The Pink Lady of La Jolla. We purposely chose La Valencia, part of the Preferred Hotels Worldwide, for its classical Spanish architecture. Built in 1926 as an apartment hotel, it has survived many transformations and now boasts 114 luxurious guest rooms. As I walked through the lobby, I was immediately transported to an exotic and beautiful Mediterranean hotel and fell in love with it on the spot! (You can read more about this great hotel in the Stay & Play section of this issue). Once unpacked, showered and rested, we left our magnificent ocean front villa to walk along La Jolla’s coastline, just steps away from our hotel. We feasted on the magnificent views of breathtaking beaches and walked along dramatic cliffs, sandy expanses and secluded coves. With camera in hand, I immortalized splendid ocean views, swimmers, sunbathers, snorkelers, surfers, and dozens upon dozens of seals resting comfortably on shores. Time just seemed to stand still for us as we drank-up the beautiful coastline before us. Fully content, we made our way back to La Valencia Hotel with a mind to enjoy the last speck of the sun’s setting into the ocean from our private terrace while sipping on a glass of California cabernet sauvignon. Perfectly romantic! Our first dining experience took us to NineTen restaurant located in the Grande Colonial Hotel, just minutes walking distance from La Valencia. Nine-Ten defines itself as a unique seasonal style of “Evolving California Cuisine”! Under the supervision of Chef Jason Knibb, named “Chef of the year – San Diego 2014” by the California Restaurant Association, he is known to prepare delicious meals from fresh produce brought in by local artisans from their daily harvest. I enjoyed a sumptuous swordfish, paired with a California wine - A wonderful way to end our first day! After a restful sleep that helped us recover from jet lag, we were ready to hit the pavement and discover the hidden treasures within the vicinity of La Jolla. Our morning comprised of visiting two major attractions: The Museum of Contemporary Art San Diego in La Jolla, showcasing an internationally recognized collection by some of the world’s most renowned contemporary artists followed by a visit to The Birch Aquarium at Scripps, where you can view coral reefs, sharks, jellyfish and much more. end, we decided to offer ourselves a real treat. For our 3rd dinner affair we chose Island Prime, a restaurant set on stilts above San Diego Bay, overlooking the city skyline and Coronado. It is by far the most beautiful panoramic view of the region. The service and the food were sublime with everything cooked to perfection. We had the pleasure of meeting the renowned chef Deborah Scott, who gave us a taste of some delicious appetizers. To finish off this wonderful meal, our waiter insisted we try the Retro Island Prime Mud Pie, with a promise that we would not be able to polish it off… he was right, I had never seen such a huge piece of pie. With a pang of sorrow, we left the following morning with more than 200 pictures with a few mementoes in our luggage on our way to our second adventure… Los Angeles! Welcome to LA! Because it’s only a 2 hour drive from San Diego to Los Angeles, we knew that we would have extra time on our hands before checking in to our hotel. We planned our day well in advance to maximise our time in LA with our first stop being Santa Monica and Venice beach! It was a perfect autumn day, blue sky, peaceful and beautiful, such a nice way to enjoy the moment along the boardwalk. After lunch, we moved onto Venice beach, which does not quite have the same tranquility as Santa Monica. It is filled with street vendors and unusual stores and entertainment like some awesome skateboarding from locals. I was amazed by their agility, speed and talent. We heard music from street performers and gospel from street preachers. We saw people training in an open-air gym located at ‘Muscle beach’. Venice beach is a place where you could spend an entire day just people watching, it is entertaining, lively and filled with action. We left reluctantly, but with purpose to be on time for a very special activity, a grand tour of Warner Brothers Studios. For about $60 American, you will get a 2 hour guided tour through iconic backlots where great movies and TV shows were filmed. You will get to visit the Archive to view the Batman and Harry Potter exhibits, and also the Picture Car Vault, which is a room transformed into a BATCAVE that exhibits incredible Batmobiles used in the films like the Tumbler, Bat-Hammer and the Bat-Pod. You will also be shown the Central Perk set from FRIENDS and enjoy a photo-op while lounging on the famous couch with coffee in hand! You can then finish your tour with a self-guided visit to Stage 48 (script to screen), where you will explore the key phases of the entertainment production process at how the magic of Hollywood is made, and if you wish, take a picture with a real Oscar – expect this part of the tour to take an extra 45 minutes but it is well worth it! For our 4th dining experience, we wanted to choose wisely, as dinning in Los Angeles can be overwhelming, with hundreds of restaurants to choose from and many requiring reservations dates in advance… If you have an idea of what you want prior to leaving, book ahead – that’s what we did! Friends of ours recommended we try Birch, a quaint little restaurant located on Cahuenga Blvd., and about a 15 minute walk from our Hotel. Ever curious, I was eager to try out some of the many raved about dishes posted on line and produced by Chef Brendan Collins. As you enter, you can tell you will enjoy yourself after being greeted by a charming hostess. This small and cozy restaurant is bustling busy and by far, a local favorite! By the time we left the WB Studios, we were ready for a little rest at our hotel before dinner. We checked in at the Loews Hollywood Hotel, located in the middle of all the action! You will find the Dolby Theater (where the Academy awards ceremonies are held) adjacent to the hotel with the Walk of Fame, TCL Chinese Theater, and much more. Our room had the view of the famous Hollywood hills, with the «HOLLYWOOD» sign bright and clear right in the middle. (You can read more about this great hotel in the Stay & Play section of this issue). Over years of travelling, I have come to appreciate a certain routine; rise early, sightsee all day, return back to hotel in late afternoon for some rest and cocktails before heading back out for dinner and a night-out in town… So what pleasure it was to just sit back comfortably, catch up on my travel journal, and sip on some perfect Chardonnay while munching on delectable local cheeses… ah the beautiful life! The portions are smaller and you may choose to share several dishes with friends. We particularly enjoyed the rabbit baklava with dates, white beans, pistachios and carrots, and the monkfish tikka masala with basmati rice cracker. Everything was fresh, elegantly served and delicious. How to make the most of your one day stay in LA! With our two Starline Tour passes (about $40 US each), we had a choice of six different colour code routes to choose from. Each route will take an average of 1 to 2 hours from beginning to end. Of course, you can hop off anywhere the bus stops, and hop on back again, it is important to factor this in your time schedule if you choose to do multiple routes… Since we already had done some sightseeing the previous day, we chose the red route, which is a two hour ride through Hollywood and Beverly Hills. We hopped-off in Beverly Hills and walked along the famous Rodeo Drive looking inside chic boutiques eager to spot anyone famous! By late afternoon I kept shopping while my husband went to the downtown core. For our 5th dining experience, we chose to eat at The Hungry Cat, located on Vine Street. This restaurant serves excellent high quality seafood – we ate their clam chowder for starters, and enjoyed Oysters, fries and beer as the main meal, the perfect comfort food for our busy day. Of course this being LA, we enjoyed our meal outdoors. As we gazed at the stars reminiscing on our two day stay in Los Angeles, we were very impressed by the city’s charm. Not one to enjoy large crowds, I felt very secure in Los Angeles, it is a clean city, and the locals are friendly and courteous and the food is exquisite – Magnifique! Santa Barbara We would take the next couple of days to drive through some spectacular vistas. Our first destination was Santa Barbara to enjoy a few hours in this charming city. We first drove to the famous Stearns Wharf which is California’s oldest wooden working Warf. I got an eyeful of the beautiful ocean and Santa Ynez Mountain. There were not many sunbathers on the beach on this November day, but none the less, the beach was beautiful and tranquil. We decided to linger on for lunch, by walking along State Street, built with cobblestone and filled with fun boutiques and restaurants. Before leaving, we finished our tour of the city center at the Santa Barbara Courthouse, where we saw how Santa Barbara became the city it is known today painted on the walls of the courtroom. We also climbed to the clock tower to enjoy one last spectacular view of the city and its surrounding. mate. We were heading for San Luis Obispo, a wonderful and well known wine region of California populated by artisan vintners and family-owned wineries. The region is unique for its distinct growing conditions, from oceanfront settings to wide-open back roads. You can cover the entire vineyard region within a 30 minute drive. Vineyards closest to the pacific oceans amid the rugged Santa Lucia Mountain range boast of their unique soils and cooler environment, said to bring out exceptional balance and flavours to their wine. Our 6th dining experience was a memorable one! We were invited to dine with local winemakers under the stars in the heart of the Edna Valley at SLO Wine’s Crafted on the Coast Winemaker Dinner. Dinner was prepared by the acclaimed chef Julie Simon, and paired with wines presented by winemakers/proprietors Ryan Deovlet (Biddle Ranch), Tom Greenough (Saucelito Canyon), Steve Autry (Autry Cellars), Christian Roguenant (Niven Family Wines), Don & Gwen Othman (Kynsi), Coby Parker-Garcia (Claiborne & Churchill) and Mike Sinor (Sinor-LaVallee. An evening that will forever be etched into my memory. I truly saw the passion and the art in each of these winemakers. Many thanks to Heather Muran for inviting us to this wonderful and memorable soirée! The next day, after being well-rested at the Sands Inn and Suites, we ate with Molly Cano, from the visitors’ centre, who took time to show us around Downtown San Luis Obispo. It is such a quaint, charming town and I only wish I had an extra day to linger here. Don’t pass on this little jewel, it’s like a hidden secret and deserves to be discovered. this world, but this was by far the most spectacular coastal scenery I have seen, with a pure blue, clear California sky! Highway 1 offers spectacular views all around, and my poor husband had to drive infinite curves, with each new turn we were in awe with the scenery. You must add on extra time to your trip, because you will be making several stops along the way. You will also need to give your driver some time to enjoy the views as well, and some rest, as it is not an easy drive with all the ups and downs and curves and listening to the passenger going ooh and ahh every other minute is quite distracting. There are several trails along the way for those that wish to make it a full day activity. Just take your time and enjoy this drive, it is well worth it! We arrived at Carmel by the Sea just 30 minutes before sunset. Enough time to check in to Hofsas House, a quaint hotel set in the higher part of Carmel, on San Carlos Street. We unloaded our luggage, put on our running shoes and made our way to the beach for a memorable sunset picture, where, upon arrival, we were not surprised to see hundreds of people doing the exact same thing! We walked slowly back to our hotel, browsing through the numerous little stores, galleries and coffee shops. Carmel is the perfect town for artists, I could see the painter in me, dying to set up my easel and capture the magnificent views of this charming city, but after a long day traveling on Highway 1, it would be an early dinner for us at the local Pizza place, get to bed early, for tomorrow would also be another busy day traveling. courses and much more. We were up early the next day to make the most of the few precious hours left on our schedule to enjoy this splendid area. Since we spent most of our previous day driving on highway 1 and got our fill of breathtaking views, we decided to visit the Monterey Cannery Row district and the Monterey Bay Aquarium. The Monterey Bay Aquarium offers an amazing view of the sea-world. It is a beautiful Aquarium, very interactive for small children and well known for its school programs. They offer multiple exhibitions such as the Tentacles, Giant Pacific Octopus, the Monterey Bay Habitats, the Open Sea, the Rocky Shore, the Sandy shore, Sea Otters and the Penguins. Both my husband and I were amazed by the grandeur of this aquatic monument. After spending a couple of hours indoors, we opted for a lovely walk around the oceanfront district where you can find some great gift shops, restaurants and galleries. Satisfied with our morning adventure, we left this beautiful region with countless mementos, anxious to get to our next destination! San Francisco and much more It’s about a 2 ½ hour drive from Monterrey to San Francisco, so we headed directly to our hotel. We wanted to quickly unpack, freshen up and enjoy the last vestige of the sun in this fun city. We stayed at the Pier 2620 Hotel – fisherman’s wharf– located at 2620 Jones Street. This quaint hotel boasts 233 guest rooms and is located in historic Fisherman’s Wharf, 3 blocks from Pier 39, a couple of blocks away from both the Cable Car turnaround and the street car line. As we wanted our last three days to be perfect, we opted for a suite, enjoying the comfort of a larger room, decorated with nautical flair, comfortable couch and cozy throw to lounge on after a long walk in this windy city! All this would have to wait for we only had a few hours of daylight left to tour San Francisco. (You can read more about this great hotel in the Stay & Play section of this issue). After spending a couple of hours in the Muir Woods we were ready to go back. We arrived in San Francisco with enough time to visit the city in broad day light (sun sets early in November). Using our city passes, we enjoyed a city tour with the hop-onhop-off buses, learning about some of San Francisco’s history, finishing up in the city center for some last minute shopping. Our last Californian dinner was at the Fog Harbor Fish house at Pier 39. This favorite local family owned and operated restaurant offers the freshest seafood in San Francisco. The menu is rich in various seafood dishes ready to please everyone’s palate. Located on the second floor of the Pier, our table offered a beautiful view of the Pier 39 Sea Lions. While my husband enjoyed their award winning Clam chowder (best one he’s ever had) for starters before getting his Surf and Turf meal, I preferred to leave room for my Shellfish Platter – garnished with crab, mussels, clams, shrimps and much more… What a delightful meal, everything served with perfect taste and attention, an excellent service, a memorable night! eties and are sold exclusively from the winery. We enjoyed a personal tour of this unique Winery Estate, with its multiple rooms of award winning wines, mementos of family history, the famous Visitors Hall of Fame room, and much more. Our grand finale was, of course, the wine tasting room, where we enjoyed tasting some of their finest wines. We were then left on our own to browse in the Winery store while a picnic was being prepared for us by the folks of Sattui. Their store is filled with great foods, artisanal cheeses, great charcuteries, and all sorts of other products that make choosing the perfect wine bottle a memorable experience! I could not resist a bottle of their 2012 Doctor’s Vineyard Pinot Noir and their 2012 Napa Valley Cabernet. With our picnic ready, we moved to a superb outdoor terrace facing a beautiful rose garden still blooming in November, to enjoy a delightful meal filled with local produce. This was truly a wonderful way to end this tour, sitting just the two of us enjoying great views, while feasting on great food and great wine. For more information on The Sattui Winery, please visit their site at : https://www.vsattui.com Our second destination, The Cairdean Estate is also situated in St-Helena. The estate is a one-of-a-kind wine and food destination offering multiple wine tasting experiences along with spectacular dining and shopping. Cairdean complements its contemporary winery and tasting room with two unique dining experiences: 1) The Farmer & The Fox restaurant, recipient of a 2015 Michelin Bib Gourmand Award, is a European-style gastropub in Napa Valley. Sourcing the best quality produce and ingredients from local farms and producers, its seasonal menu is a creative and locally-inspired ode to the classics dishes of Scottish and English pubs. Closed for the winter season, but will open for private dining experiences. 2) Butterscots Bakery & Deli, is an artisan bakery, deli and culinary boutique serving distinctive, hand-made baked goods and picnic provisions - sandwiches, pastas, salads and sweets - inspired by Scottish and English heritage. Here also, the menus are locally-inspired using fresh ingredients sourced from farmers and vendors in the Napa Valley and Bay Area. Enjoy the wonderful view of the Mayacamas Mountains while savouring your favourite dish paired with a perfect glass of wine. For more information please refer to http://www.cairdeanestate.com/. After these two magnificent visits, we decided to do a pit stop at the Culinary Institute of America (CIA) located only a few minutes from the Sattui and Cairdean Wineries in St-Helena. This is a unique and inspiring campus for food and wine education, where great future chefs are schooled. Many well-known personages have received their education through CIA, such as Anthony Bourdain and Scott Jones to name a few… Founded in 1946, The CIA is the world’s premier culinary college, and has been setting the standard for excellence in professional culinary education. The ending to a perfect trip, spending a day in the great Napa Valley, eating great food paired with the best wines ! As we drove back to our hotel in San Francisco, my husband asked if I had a favorite activity in the course of our trip… through great difficulty in choosing, I have to admit that I will forever remember the most spectacular coastal drive on Highway 1 from LA to Carmel… Safe travels! n the last night of our whirlwind six day visit to Israel, I sat on my balcony at the David Citadel Hotel. Before me was the illuminated stone wall of the Old City of Jerusalem and at 6:00 pm the sound of church bells mingled with a muezzin’s call to prayer; a melodious expression of different faiths that has gone on for centuries. It was my first visit to Israel in 25 years and I could not help but think of the expression “The more things change, the more they stay the same”. Change was evident from the moment we landed. At Tel-Aviv’s Ben Gurion Airport, I was half-expecting to see the old wooden terminal building and not a Moshe Safdiedesigned architectural wonder. However, on our way north to Haifa, the place names: Ramat Gan, Herzeliyah, Netanya and the colourful bougainvillea along the super modern highway started to bring back that comfort feeling associated with visiting an old friend. ily experiences. Our hosts were not 55 only exceptionally personable (along with their happy dog, Toffee) but the Persian-style food they prepared was sensational. But there was more! The next day we drove about 90 minutes to the Dead Sea area where we took the cable car up to Masada, the fortress built by Herod the Great and the site where 960 Jewish zealots took their own lives, rather than live as captives and slaves of the Romans. Further south we piled into a jeep with guide Barak Horwitz from Camel Lot Tours and bounced and jostled our way up a steep, rocky path to the summit of the lowest mountain on earth. With the Dead Sea sitting at 400 feet below sea level, the Sedom Mountains tower at minus 200 feet. The view from the top is spectacular with the Dead Sea, Jordan and the Moab Mountains in the distance. And finally on our 5th day we stood on Mount Scopus looking at the city of Jerusalem, spread out before us. We toured the Old City from the Jaffa Gate to the Church of the Holy Sepulchre, and through the tunnels under the Western Wall. We visited Machane Yehuda, the vibrant Jewish Market, as well as the Shrine of the Book, where the Dead Sea Scrolls are housed. Six days in Israel was only the tip of the iceberg. On my first visit in 1976, I travelled with friends from north to south in six weeks and still didn’t see all the natural wonders, small towns and all the attractions that the country offers. But without doubt, this was a great taste of what Israel has to offer and certainly a prologue to future visits to discover more about the people, food, art, architecture, history and traditions of such a dynamic travel destination. www.goisrael.com Top; Sunrise on the Dead Sea From left: The chapel on the Mount of Beatitutes, The synagogue at Capernaum, Cesarea's Roman Aqueduct, Buying fresh fruit juice on the street in Tel Aviv, King Herod's Fortress on Masada, Machane Yehuda, The Tel Aviv waterfront stretches for miles. his was my first trip to Scotland, and though I am of Scottish heritage (Campbell and Fairbairn clans are my ancestors six generations ago,) for some reason retracing my roots there was never big on my bucket list. But when the opportunity to try out WestJet’s new direct (same aircraft) flight from Toronto via Halifax to Glasgow came up, I decided it was high time to visit the “auld sod”. A few days in Glasgow, Edinburgh and at the famous Gleneagles Resort was the plan, but the first stop I wanted to make was to visit the famous “Loch Lomond”. The Cameron HouseA Cozy Manor I’m not sure if we took the “high road” or the “low road” to get there, but one thing was certain as we arrived at the grand estate mansion of the five-star Cameron House Hotel, the banks of Loch Lomond are indeed very “bonnie”. Once out of the car, the first thing I spotted was a cute little lemon yellow biplane docked in the water just off the entrance of the hotel. It was surrounded by rich greens of the rolling hills and the scarlet leaves of the changing trees -it was November- and it made for a stunning natural scene. But what really struck me was how much the nature resembled our own cottage country up in Northern Quebec or in the Eastern Townships. It made me feel very much at home. Yet once I entered the posh lobby, it was clear I wasn’t home anymore. Overstuffed century-old chairs and stuffed heads of large gamedeer and boar- poking out of the walls in the burnished wood anteroom manned by kilt-clad doormen quickly reminded me that now I really was in Scotland! Sadly, there was a very large wedding party on site that weekend and the adorable little yellow biplane that offers aerial tours of the lake was booked solid. But we did get out on the water anyway as they have a private little luxury yacht that also takes you exploring. As we cruised along, tiny castles and sprawling estates poked through the woods here and there, and our guide was extremely well informed on their history. Afterward, we went to the marina/boathouse for lunch. On its own private little beach The Boathouse exterior was heavily populated by big flocks of geese and ducks enjoying the water as well as the handouts from the guests. Sailing, fishing, even jet skis rentals are also offered there. But the surprise was the restaurant theme itself. The Boathouse is a large cottage style dining room with big verandahs that’s far more New England than old Scotland. Nary a haggis or blood pudding on the menu! Instead, there were fish and chips and fresh seafood, gourmet burgers and even a brick oven for artisanal pizzas. Not at all what I expected. But we did manage to go local on the drinks’ front with hearty stout beer and the excellent Glengoyne Scotch from the local distillery. There are two other dining spots in the hotel -one a fancy Michelin star gourmet affair which we didn’t get a chance to try, and the causal Cameron Grill that specializes in steaks and even has a salmon bar. But we were quite happy with the grill- the fare is hearty but high quality, and the ambience very cozy enhanced by roaring fires and a super friendly staff. the lake below were worth it. There’s also a point on the highest hill where you can stand with one foot officially in the lowlands and the other foot in the highlands! Also cool is an entire boat buried up to its bow on dry land that serves as a fun snack spot for hungry and thirsty golfers. But it was the complex at the final hole that proved to be my favorite- The Carrick Spa. Our guide told us it’s also a favorite escape for nongolfing partners where they can get pampered while they wait for their mates to finish play, and they can spot them coming in from the gorgeous outdoor infinity pool. But you need not cart out the golf area for some liquid luxury and relaxation. The Cameron Club right in the hotel is also a massive complex of pools, whirlpools, saunas, steam rooms, and also a fitness center. And the entire club is all wrapped up in to ceiling-to-floor glass so you can enjoy views of the lake while you partake. A Short But Sweet Stay Throughout our visit, we found the staff warm, welcoming and always goodhumoured, no matter what our request. And though we ran out of time before we ran out of pleasurable pastimes, it was an ideal introduction to Scottish hospitality at its best. And I was very happy to finally see the region made so famous by the song “The Bonnie Banks o’ Loch Lomond.” It was an enchanting experience. thoughtful accents and a lovely bay window looking onto the lake. And there were many high tech amenities, too. But as welcoming as my new abode was, I had lots of property to explore and first up of course was the “loch”. Located in the Rio Grande Valley, eight kilometres from the Mexican border, McAllen is one of North America’s top birding destinations. Over 540 species have been spotted here, as it’s both an important migration route and permanent home to an impressive number of feathered residents. Barbara and her husband have been bird and butterfly watching for decades. But for me, it was my first birding adventure, and I couldn’t have picked a better place for it than McAllen, Texas. seen in a calendar year), competition can be stiff, and every bird matters. This is good news for McAllen, Texas. “Every rare bird sighting counts for over $100,000 in revenue,” says Nancy Millar, director of McAllen Convention and Visitors’ Bureau. “Wildlife watchers bring in 463 million dollars a year and 6, 600 jobs.” But I had arrived in McAllen without a list, or even, I’m embarrassed to admit, a pair of binoculars. It turns out I didn’t need either to experience the thrill of seeing the bright tropical colours of the Altamira Oriole and the Great Kiskadee, or hearing the talkative Chachalacas who were never shy about making their presence known with their cries of “Chaaa – chaaa—laaac.” There are 28 nature sites in the area, but here are the ones that belong on every visitor’s itinerary. My list grew bigger at this wildlife refuge established in 1943 for the protection of migratory birds due to its positioning along an east-west and north-south juncture of two important migratory routes. It was at this location, I made my first sighting of a Pauraque, an owl-like nocturnal bird found mostly in South America. This sleeping beauty was so well camouflaged that it took a few minutes to distinguish it from the surrounding bushes. pleasure is warm southern sunshine, delectable Mexican cuisine and friendly people, making it an unbeatable bird-watching vacation. COOK ISLAND’S CRYSAL BLUE LAGOON Perfectly placed on the edge of Muri Beach, Crystal Blue Lagoon is a paradise beauty that recently opened in the Cook Islands. Sleeping under a Safari tent in Rwanda Situated 7 kilometers away from Rubavu town, INZU Lodge is perched on one of the hilltops surrounding beautiful Lake Kivu. It is an eco-lodge that offers safari tents. The tents are handsomely decorated and furnished with one double bed, or twin beds, night tables, shelving and chairs. The reception area and the restaurant were built according to traditional rwandan architecture. The ceiling of the reception is a masterpiece. It’s woven with natural materials and it gives you the impression that you are inside a giant traditional basket that can be found at all Rwandan markets. The restaurant’s menu contains an interesting mix of traditional dishes (Sambaza, ubugali, grilled fish) as well as international dishes. The reception area contains a gift shop where delightful surprises await you. The majority of the art here is made by local non profit organizations or local cooperatives. INZU Lodge is actively involved in the village life where it is located. A special project called Dumbo Back to School was initiated in 2012. This project enables village students to buy uniforms as well as school supplies. Money is collected through the sale of little elephants made out of fabric by a local women’s cooperative. INZU Lodge is the place to relax and enjoy life in Rwanda. Taking its name from the irresistible blue waters of the infamous lagoon at Muri Beach, Crystal Blue Lagoon offers a blissful beachfront experience.Couples or groups of friends and family will be inspired to recharge at these sophisticated villas that have been stylishly designed to every last detail. With sweeping lagoon and ocean views, this gated duplex sanctuary consists of four spacious two-storey, two-bedroom accommodations wrapped around an impressively large infinity pool that flows endlessly towards the tranquil clear waters of Muri Lagoon. YASAWA ISLAND RESORT IN THE FIJI ISLANDS From the distinctive contemporary Fijian style bungalows fashioned with palm thatched roofs, plantation shutters, an expansive sun deck, a private beach hut on the edge of the sands and personal hammock, the luxurious one island resort evokes “life as it is meant to be,” an experience that rejuvenates the senses and stirs the soul. The one island resort boasts 18 luxury bungalows hidden among luscious tropical greenery, each only a few steps from a pristine white-sand beach. On land and at sea, a multitude of resort activities provide something for everyone. Guests enjoy swimming in the crystal waters of the famous Blue Lagoon, snorkeling among vivid corals and tropical fish, sea kayaking, boating on a catamaran, deep sea fishing, stand up paddle boarding and windsurfing. Back on shore, they enjoy tennis, volley ball hiking and rugby matches. The first Preferred Hotels & Resorts Legend Collection property in Bali, The Katamama presents 58 elegantly appointed suites inspired by the rich heritage of Indonesia and a highly astute attention to detail, with every aspect of the hotel featuring bespoke design elements crafted by the finest local artisans. Amenities at this intimate luxury hotel include an in-house gym, private pool and pool deck, the Akademi ‘Centre of Mixology’ created by award-winning mixologist Dre Masso, and a specialty restaurant featuring Spanish cuisine. The Katamama is located in Seminyak the upscale area in tropical South Bali, known for its beaches, world-class nightlife, shopping and local attractions – next to the award-winning Potato Head Beach Club. Wanda Reign on the Bund is the flagship hotel of Wanda Hotels & Resorts, the largest luxury hotel company in China. Designed by the globally acclaimed Foster & Partners, this iconic hotel features an art deco influence that integrates architecture styles of different cultures with the classical art forms of Shanghai, including significant details such as the city’s flower - the Magnolia, in its design. Upon its debut, Wanda Reign on the Bund will offer 193 opulently inspiring rooms, including 14 suites and a 288 square-meter Chairman Suite with unobstructed views of The Bund, Huangpu River, and Pudong Skyline, each equipped with wireless control dashboards, valet service boxes, and exclusive Hermes or L’Occitane amenities, as well as amenities such as five food and beverage experiences that will include MARC, a French fine-dining restaurant by 2-star Michelin chef Marc Meneau. Klapsons The River Residences Bangkok offers 77 serviced and private residences situated more than 23 floors directly above the iconic Chao Praya River. Designed by William Sawaya of contemporary design forerunner Sawaya & Moroni, this unique property invites guests to enjoy picturesque riverside views and dedicated services such as a private pier with ferry shuttle to the nearest rail station, providing convenient access to all of Bangkok. One of three Preferred Serviced Residences properties in Southeast Asian, klapsons The River Residences Bangkok is the ideal homeaway-from home for long-stay corporate travelers and small families on an extended holiday in the Land of Smiles. Once a thriving colonial tin mining hub in the 1930s, the city of Ipoh has evolved into one of Asia’s up-and-coming must-see destinations for both business and leisure travelers and is home to the WEIL, a member of the Preferred Hotels & Resorts Lifestyle Collection, which is presented in the backdrop of the city’s old town heritage. Adjoining the Ipoh Parade Shopping Centre, the hotel epitomizes genuine Asian hospitality throughout its 313 stylish and contemporary guestrooms and amenities that include six distinctive dining experiences and a rooftop infinity pool and bar. OD Port Portals hotel The OD Port Portals hotel is an ideal place to stay while in Mallorca, as it is situated slightly outside the capitol city of Palma. This is a relatively new property, close to the luxurious yacht harbor of Puerto Portals that features many first-class restaurants, bars and boutiques. Combining good location and excellent service, there is more than enough glamour for the discriminating visitor, with great décor, attentive staff and clean, modern rooms. The hotel offers rooms that are fully equiped with all the necessities including wifi, exclusive toiletries and luxurious bedding. They are an ideal setting for an unforgettable vacation, where every morning greets you with splendour, comfort and the horizon of the Mediterranean Sea. In-house restaurants serve a gambit of delicacies, from health-conscious cuisine with Asian and European flavours to an à-la-carte restaurant decorated with classic furnishings. Muted hues and soft lighting embrace diners at breakfast, lunch or dinner. The hotel is close to all activities, including the Costa d´en Blanes and Portals Nous beaches as well as excellent golf courses like the Bendinat´s Royal Golf. When not out and about discovering Mallorcas secret spots, guests can enjoy access to tennis courts, a gym, swimming pool and spa treatments and massages à la Carte Relaxation is the goal within the hotels exquisite terrace solarium that is fitted with decadent sun loungers, oversized parasols, comfortable lounge beds and towel service – everything at a guests fingertips. It is easy to imagine the countless reasons to visit and stay at this magnificent hotel. A wedding on the beach followed by a resception in the gardens. A meeting of business partners in one of our meeting rooms that offer a stunning view to inspire negotiations. Or a week-long getaway with or without the kids! Come and see what the mediteranean is offering! Near the heart of Palma de Mallorca, this beachfront hotel has the feel of a palace. Luxury in all forms greet guests, from the rooms equipped with the latest technology to the facilities set up for any need – work, rest or play. There is a multitude of indoor and outdoor spaces, ideal for hosting your meetings, weddings and celebrations .and from the street, the property heads down to a fabulous mediterean beach. The name of the game here is food, though. The Hotel Nixe Palace offers a wide array of gastronomic choices to treat your palate with Mediterranean cuisine at its best. with a prime location on the terrace, the Bistro offers unbeatable views of the Bay of Palma while enjoying a wide variety of snacks, sandwiches and salads. The “A POPA” restaurant is an exclusive culinary venue with a scene recreating the stern of a boat and sea imagery. It offers a creative market cuisine and prides itself on its fish and shellfish specialities. There are a couple of delightful bars, including one on the terrace of the Hotel pool and another in the lobby. Perfect localses to enjoy a refreshing drink and a light meal including salads, Tapas, pasta or pizza. Aside from food, the NIXE HERBAL SPA has been created to fill guests in another way - calmness. Placed on the beach with direct access to our solarium terrace, there are unforgettable views of the sea to enjoy while being pampered from head to toe. Jumeirah port soller This is undoubtedly a land of luxury, and the Jumeirah Port Soller hotel & spa is a true representative of this fact. Built on a cliff, it overlooks the fishing village of Port Soller, and as a tribute, the hotel has a nautical feel. It is also surrounded by the Tramuntana mountain range, and likes to say that the hotel appears to` float between the sky and the sea.` Private balconies offer magnificent views and great whenever you want to take a magnificent selfie for that picture perfect postcard. The balmy Mediterranean climate and glorious natural setting make it an ideal place for al fresco dining, and offers a choice of three bars and two restaurants serving Spanish delicacies. Though close to the hustle and bustle, the hotel is a world away from the stresses of modern life. Great views and food aside, the Jumeirah Port Soller hotel & spa is renowned for the luxurious Talise Spa. A rejuvenating break can be found within the grounds of this magnificent oasis that offers modern spa treatments that use natural ingredients such as citrus, almonds and olive oil. A state-of-the-art gym, two swimming pools and a spacious ballroom provide more ways to relax, unwind and enjoy the pocture-perfect Jumeirah Port Soller. Son Brull hotel This small boutique hotel, away from it all in the country, is an ideal getaway for lovers and others who wish to enjoy an Old-World experience with modern luxuries. With grape vines, olive and citrus trees, guests can imagine the olden days where vineyard owners would watch from the balcony as the workers collected the savory grapes for fine wine. It has a rich history as it was a12th century monastery. The transformation into a hotel has been studiously made and very stylishly renovated. The modern incarnation sets the tone for a calm and peaceful stay. Inland with good views over the mountains and valleys, the Son Brull on Mallorca is pleasing to both body and soul. It offers comfortable, upscale rooms with scenic views and a restaurant and tapas bar that uses produce from the property, including sumptuous breads and a homemade gin and "citric" liqueur to wash it down with. Belmond La Residencia The BELMOND LA RESIDENCIA is located in the tranquil north-west coast of Mallorca and is considered one of Spain's finest luxury boutique hotels. Tucked away in a valley the guest houses and spa sit in lush gardens replete with olive and citrus groves on the edge of the artist village named Deià. There are magnificent views from this property, as deep green hills lie all around and the grounds have hidden gardens, a pool and many splendors to greet guests. Forty acres of the land are used for Organic Farming, and the olive grove within is more than three centuries old. Stroll the land and then hit the spa to relax, time to savour, time to stay. Guests can enjoy day trips and excursions, with a walk with donkeys up one of the local hills or complimentary two-hour boat rides along the coastline exploring secluded coves. Staying at the hotel, guests can enjoy a swim in one of two outdoor pools, play a game of tennis, workout in the gym or explore the hotel’s acclaimed art gallery or one of Spain’s largest permanent sculpture gardens. Its growing exhibit includes pieces by famous international sculptors and local up-andcomers. The sculptures offer everything from graceful bronzes to fun works that children can play on. Article & Photography by Johanna Read, TravelEater.net he best hotels are ones that go above and beyond, and the Fairmont Chateau Whistler is one of the very best -- the largest true ski-in, ski-out hotel in North America, in the continent’s number one ranked ski resort. Adventure Group. In all seasons, zipline with Superfly Ziplines or ride a bobsleigh down the Olympic course at the Whistler Sliding Centre. What does going above and beyond really mean? How about being able to ski right up to the base of the hotel and trade your skis for a hot chocolate with the ski valet. How about exploring the mountains with a Whistler Experience Guide, a longtime local who takes ability-based groups of skiers and snowboarders to WhistlerBlackcomb’s best terrain and freshest snow. The Fairmont has the largest pool deck in Whistler with an indoor/outdoor pool perfect for enjoying the mountain views, three outdoor whirlpools and one indoor, and an outdoor 60-foot lap pool equipped with underwater music to motivate you to swim extra lengths. Indoors there’s a sauna and a steam room fragranced with eucalyptus, and a spa which includes two handcrafted cedar steam cabinets. Back at the hotel, you’ll really appreciate Fairmont’s extras. guests are treated to Canadian pastureraised premium Angus beef, organic produce from nearby Pemberton farms, and pairings with the finest wines from British Columbia and the world. Servers will even sabre a bottle of Champagne before your eyes if you’re celebrating a special occasion. In the wintertime, Fairmont guests enjoy alpine fondues at The Chalet, followed by an evening sleigh ride from Blackcomb Sleigh RIdes. The Wildflower is the place for incredible breakfasts and extravagant brunches, as well as daily dinners of seasonal Pacific Northwest cuisine. If you want to hit the slopes early, Portobello Market & Fresh Bakery has deliciousness to grab and go as well as made-to-order breakfasts, lunches and dinners. After a day spent outdoors, head to the Mallard Lounge for creative and traditional cocktails and singlesourced chocolate tastings (matched with wines, ports or whiskeys) at the Chocolate Bar. craft workshops, egg tosses and a family Easter bunny hop dance. Squamish and Lil’wat First Nations. The award-winning Squamish Lil-wat Cultural Centre (SLCC) preserves the cultural identities and histories of these two indigenous nations, and shares them with Whistler’s residents and guests. In the summer of 2015, Fairmont Chateau Whistler and the SLCC opened the Salish Stroll, a pathway to ethnobotanical trails maintained and interpreted by SLCC’s Aboriginal Ambassadors. The Salish Stroll takes guests through the forest and allows them to immerse themselves in the arts, culture and heritage of Whistler’s First Nations. Want more art and culture? Walk from the Chateau Whistler to the Audain Art Museum, opening in early 2016, with one of the world’s best collections of First Nations masks and the works of Canadian artists like Emily Carr, Jack Shadbolt, E.J. Hughes and Gordon Smith. Fairmont Chateau Whistler’s commitment to sustainability takes many forms. They are currently working with AWARE (the Association of Whistler Area Residents for Environment) on a compost and recycling diversion project that includes standardized bin organization and signage, as well as staff training practices that all Whistler hotels can use as a benchmark. When will you next be taken above and beyond by the Fairmont Chateau Whistler? and we had some great conversations 69 – with our guide helping to interpret. We got to hear about their lives and they asked about ours. At the end, we bought small souvenirs that they had made. Hoa told us that we didn’t have to buy anything, but we wanted to give them something back for sharing their time with us. During our time in North Vietnam, we stayed at one of the most amazing places ever – Topas Ecolodge – located in Hoang Lien National Park, about a 45-minute drive out of Sapa (although, since we hiked quite a few miles towards the lodge, our drive was only about 30 minutes). It was one of the most memorable places we have ever experienced in all of our travels. The accommodation was good and the food was excellent, but the view makes this a must-do. It felt like we had been photoshopped into a movie scene. I didn’t want to do anything except sit on the deck of our balcony and look at the view. It took my breath away. And as the sun set and rose the next morning, the mountains took on different characteristics. It was stunning. After taking the night train back to Hanoi, we headed through the Red River Delta to Halong Bay, which is spectacular in a very different way. We spent two nights on a luxury Vietnamese junk, viewing the limestone karst landscape – which is a World UNESCO Heritage Site. Along with visiting a floating village, we kayaked off of the junk – ducking in and out of caves and coves in the bay. I took a cooking class onboard and we did Tai Chi on the top deck each morning, overlooking the beauty of the bay. pay respects to the preserved body of the country’s beloved leader. We then headed north, via overnight train, to arrive in Sapa, a beautiful mountain town offering views of stunning vistas and impressive rice terraces. On a bike ride up into these mountains with our guide, Hoa, we came across an unplanned experience – several hill tribes celebrating the planting of the rice. In amongst hundreds of locals, we appeared to be the only non-Vietnamese. Hoa – sensing our Canadian concern that we were infringing on their celebrations – explained that the Vietnamese people don’t think that way. They have a “the more, the merrier” approach to celebrations, to work and to life in general. They are a very social people. Hoa encouraged us to take photos – another concern we had that we apparently shouldn’t have worried about. As soon as I lifted my camera, several little children came running up to me to pose – their faces full of smiles and their hands tightly holding onto their big sticks of sugar cane. The next morning, we headed to the Golden Stream Valley. Trekking up the incredible rice terraces – which is like working out on Mother Nature’s stair climber – took some energy. While our guide was clearly more fit than we were (he also guides challenging tours and keeps up with Ironman competitors), he was sweet, charming and encouraging – taking time for breaks and to show us where we could take incredible photos. As we got into some of the villages, Hoa took us for a cold beer – which, I have to say, had never tasted better. Coming home to Canada, I felt like I had learned something about Vietnam and the people who live there. As a side benefit, I also didn’t gain any vacation weight. Seeing the sites is always interesting, but the real memories – like the conversations with the women of the hill tribes, where we both realized we aren’t so different from one another, coming across a rice planting celebration, and the discussions with our guide about our respective lives are experiences that money can’t buy. These are the experiences that we will remember forever. lowing reviews and exceptional food are the order of the day for this up-and-coming airline! Part of the Star Alliance network, Turkish airlines (THY) offers service to Canadians from Toronto and Montreal, and connections to destinations all over the world from their hub in Istanbul. Their aircraft includeA330s, A340s, B777s, B737-800s and B727800s, all well maintained and laid-out with the customer in mind. Each section is designed with creature comforts taking front and centre. The seats throughout the plane are comfortable and the facilities are kept impeccably clean and organized. Most Business Class passengers can expect either fully lie-flat seats or angled lieflat seats that brings relaxation to a higher level. Building on their international reputation, THY has been climbing the ranks as a top provider and doing very well in Canada. Comfort Class is Turkish Airlines' premium economy section is highlighted by slightly larger seats configured in two-by-three-bytwo rows, a large video screen and entertainment system with an iPod outlet and a laptop power outlet for each seat. With 200 destinations, and adding new ones at a rapid pace, THY welcome travellers with smiles and a friendly hello, though often with a charming accent! To help them usher in this growth, THY has a massive, world-class training center in Istanbul with numerous simulators. Pilots, flight attends and support staff are all trained well and are ready to go after their courses are done. Even passengers traveling in Economy Class can enjoy an above average trip, as all passengers enjoy the famed THY complimentary meal. Though multi-course meals are provided in Business Class on extended range flights, all passengers are treated to the award winning food served on board. Considering that THY deals with one of the worldâ&#x20AC;&#x2122;s biggest (maybe the biggest) catering service and are partners with Do & Co., there is no surprise in the quality THY can offer!